I’ve undergone, and am still undergoing, an extreme loss. I didn’t start this blog to derive sympathy. In fact, when a close friend of mine (my sister) encouraged me to write my feelings in a journal, I didn’t think I needed that. I was strong enough, on my own, to handle all the thoughts, feelings and emotions I was experiencing. The reason for this blog is because I think that not only will it prove to be a healing process for myself, but I hope to help inspire others. I also want to hear your stories and how you have overcome setbacks in life. Myth: You only grieve when someone dies. Truth: Grieving is a state that occurs when we face loss. It doesn't have to be death, it can abandonment, the feeling of isolation, or a shift in our life (outside of our control) that leaves us feeling lost or hopeless. Getting a little more personal...over a year ago, my parents and two sisters decided that it would be best, for them, to part ways with me. This broke my heart and continues to. For anyone who has faced a loss you can sympathize with what I’m going through. I’m not going to get into the details of what made them decide this, but will sum it up to say that I am not living my life the way they feel I should. It was for this reason I debated going public with my grieving process. I don’t want my parents, or other two sisters, to come across this site and feel hurt by it, or pained. But, it’s time for this blog, not because I’m casting blame, but because I need to grow. I need to progress in my life’s journey, and I believe that by sharing this process with others, I may help others and inspire. 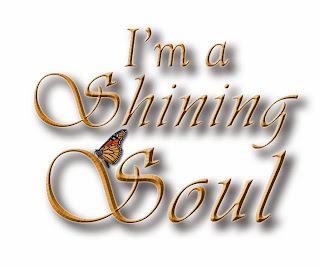 I also want to make “I’m a Shining Soul” a community where we can support one another. I encourage you to share your journey, your “ah ha moments”, what motivates and inspires you. I have made this possible by allowing submissions to the blog on the page “Share Your Story”, or if you’re more comfortable you can share your thoughts on the Facebook page. Be sure to join “I’m a Shining Soul” on Facebook, and follow on Twitter. I encourage you to share this page by using the sharing links provided on the right-hand sidebar. Tell your friends, your family, anyone who you think would benefit from this community. There’s no quick link to follow this blog via Google blog, but you can subscribe to it via email, or sign-up for the RSS feed on the right-hand sidebar. In this way you can benefit directly from the posts. You’ll have them delivered straight to you and have the ability to read them and meditate on them. Here’s to the journey, beautiful people. P.S. Since this post, I have decided to add the option to "follow" this blog on the side bar.